I found myself in a church closet over the weekend and it was an inspirational experience. Donated wheelchairs, old clothes, and dated non-perishables. Holiday closets with half-melted candles and sad wreaths. My closet experience last weekend involved none of that. Not only was everything labeled and stacked neatly, there was room to change my clothes without bumping into random mop handles. Seriously, I was energized. You could say that joy was sparked, which leads me to Ms. Kondo. I’ve written about de-cluttering church before, so I’ll try not to repeat myself. 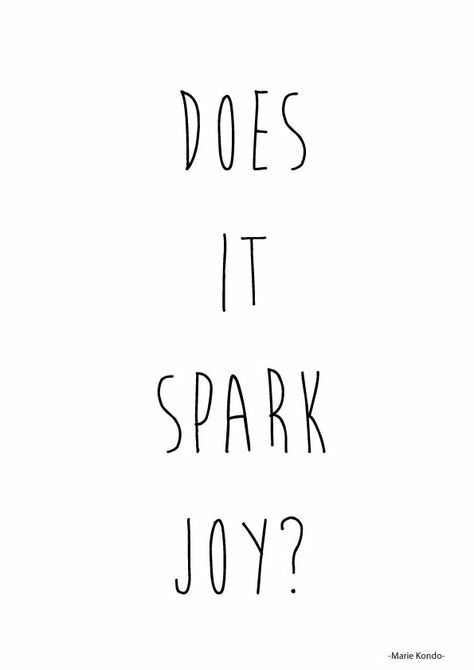 What about our Church sparks joy? This is somewhat related to yesterday’s post about de-cluttering our program calendars. But it’s more about focusing on what – in Church – inspires joy. I can’t tell you how disheartening it is to look out upon a congregation on a Sunday morning and not be able to find a single face that looks hopeful/expectant/happy/joyful. So many times I wonder why people have gathered. Few seem glad to be there. Or maybe they are just thinking really hard and their thinking faces look deceptively bleak. Maybe the average pew sitter is actually filled with the Spirit but they also shun enthusiastic emotion for theological reasons. Like Marie Kondo, I believe that human beings crave joy and order and beauty. How are we in the Church offering a community that feels like these things? Just entering the grounds of our church gives me joy as it has been so well maintained over the decades and has the feel of a meadow in a forest. The sanctuary is lean and sparse, another feeling of joy when I enter that building. However, there are storage rooms in the educational wing that need some cleaning. What sparks joy is a great place to start. Thanks, Jan. Miss having you handy.